Shalmaneser I (Shulmanu-asharedu; 1274 BC – 1245 BC or 1265 BC – 1235 BC) was a king of Assyria during the Middle Assyrian Empire (1365 - 1050 BC). Son of Adad-nirari I, he succeeded his father as king in 1265 BC. According to his annals, discovered at Assur, in his first year he conquered eight countries in the northwest and destroyed the fortress of Arinnu, the dust of which he brought to Assur. In his second year he defeated Shattuara, king of Hanilgalbat (Mitanni), and his Hittite and Ahlamu allies. He incorporated the remains of the Mittani kingdom as part of one of the Assyrian provinces. Shalmaneser I also claimed to have blinded 14,400 enemy prisoners in one eye. 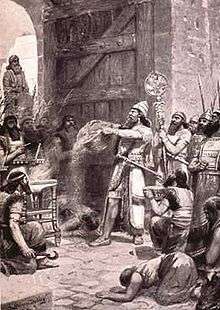 He was one of the first Assyrian kings who was known to deport his defeated enemies to various lands rather than simply slaughtering them all. He conquered the whole country from Taidu to Irridu, from Mount Kashiar to Eluhat, and from the fortresses of Sudu and Harranu to Carchemish on the Euphrates. He built palaces at Assur and Nineveh, restored the "world-temple" at Assur (Ehursagkurkurra), and founded the city of Kalhu (the biblical Calah/Nimrud). He was succeeded by his son Tukulti-Ninurta I. Annual limmu officials beginning with the year of accession of Šulmanu-ašared. The list is partly derived from Freydank and McIntyre. The exact order of the earliest limmus is conjectural but the ordering from Šerriya onwards is essentially fixed. ↑ Helmut Freydank, AoF 3 (2005), 45-56.